Text, Don't Call popped up in my mail box just before Hurricane Harvey hit and it couldn't have come at a better time. I really needed a fun, light read! This hit the spot. By nature I am a full blown extrovert that was born into a family of complete introverts (extended family included). For example, when my extended family gathered at the holidays they would literally choose starvation before saying a prayer over the meal. There would be 25 of us hanging out making small talk just waiting for that one uncle to get there because he was the designated Pray-ee. True story. They would choose death over praying in front of one another. I've glanced at some of the reviews on Text, Don't Call and wasn't surprised that most were from introverts relating. After all, most bookworms fall into the introvert category but you know I like to stand out and cause myself trouble, I blame it on my extrovert nature. 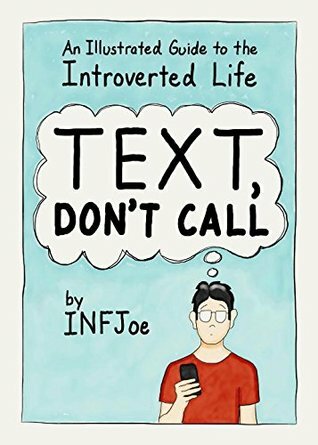 INFJoe did a fantastic job of illustrating the situations and thought processes of both introverts and extroverts. I was cracking up and running back and forth to my bedroom shoeing my husband different pages. There were so many that I could relate too and even more that had me naming names! "Hey, that's Miriam! I am so sending her this picture"
"Oh my gosh that is what Nick says all the time, huh." "... yep, that's what she does, hides behind her phone and blocks us all out." This fun book is perfect for book exchanges, gifts and for those that just need a good, relatable laugh.